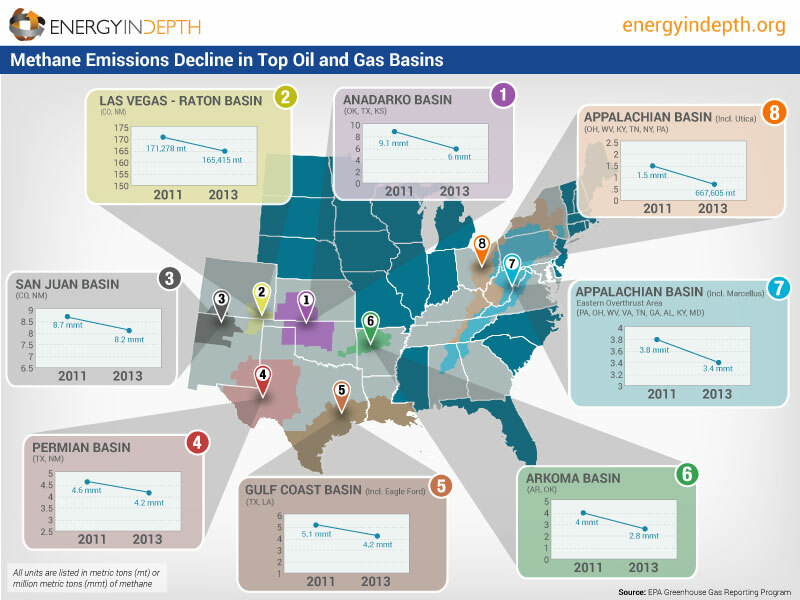 A new report by Energy In Depth shows that methane emissions from oil and gas development have significantly declined in many of the top producing basins across the country, even as oil and gas production has skyrocketed. Based on data from the U.S. Environmental Protection Agency’s (EPA) Greenhouse Gas Reporting Program, EID’s report shows that methane emissions from some of the most prolific shales in the United States have fallen considerably. For example, in the basins that include the Utica and Marcellus shales, methane emissions fell by 55 percent and 10 percent, respectively. The San Juan Basin – an area that anti-fracking activists have claimed has rising emissions – actually reduced methane emissions by six percent. In the Anadarko Basin – which includes portions of western Oklahoma, one of the top oil and gas producing states –methane emissions decreased by 34 percent. Substantial reductions have also been achieved in Texas, which is leading the United States in oil and gas production: In the Permian and Gulf Coast Basins, methane emissions decreased by 9 percent and 18 percent respectively. Check out EID’s infographic – Methane Emissions Decline in Top Oil and Gas Basins – to learn more.